León Ferrari studied engineering at the Universidad de Buenos Aires (1938-1947). He began to draw and paint in 1946, and between 1952 and 1955, when he lived in Italy, he began to experiment with ceramic art. The hanging pieces made at that time and shown at the Galleria Cairola (Milan, 1955) were irregular and hollow, with shade and light producing dynamic effects. In 1960, he displayed clay sculptures at the Galería Galatea (Buenos Aires), smooth and delicate works inspired by feminine forms. A year later he displayed sculptures made out of wood and straight wires at the Galería Van Riel (Buenos Aires), in which he dealt with issues of space, volume, and emptiness. Ferrari spent some time in Milan (1961-1962), where he began to make abstract drawings that he displayed at the Galleria Levi (Milan) and Antígona (Buenos Aires) in 1962. These drawings, in which the forms were organized in lines and had a calligraphic aspect, soon received the name of Escrituras. Shortly thereafter, he introduced legible words into his abstract outlines, which were tightly twisted. 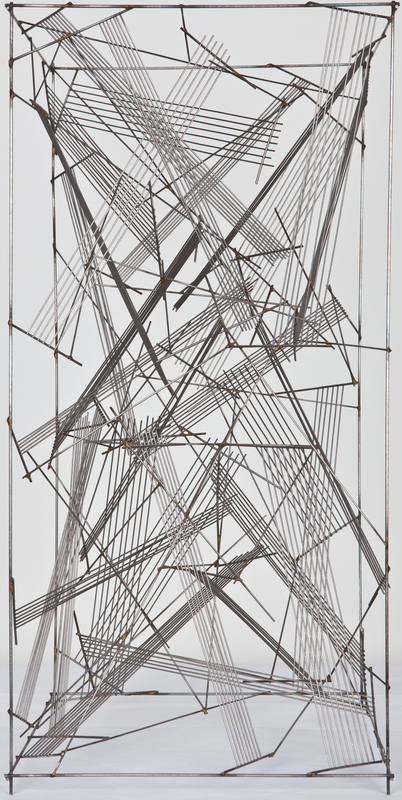 The following year he made sculptures with twisted wire, the more celebrated example being the Torre de Babel (1964). That same year he produced Manos, a series of boxes that contained hands made out of paper entangled in wire, which he showed at the Galería Lirolay (Buenos Aires). Ferrari continued making his boxes in 1965 adding political content, criticizing the Vietnam War, Western civilization, and Christianity. That same year, the works he sent to be presented at the Premio del Instituto Torcuato Di Tellas were partially censured, and those that were allowed into the show were strongly criticized. From then on his artistic production diminished. In 1968, he joined a group of artists who organized the exhibition Tucumán Arde, in which they denounced the exploitation of sugar cane workers. His political views forced him into exile in 1976. In 1977, while residing in São Paulo (Brazil), Ferrari dedicated himself with renewed interest to the development of his work. 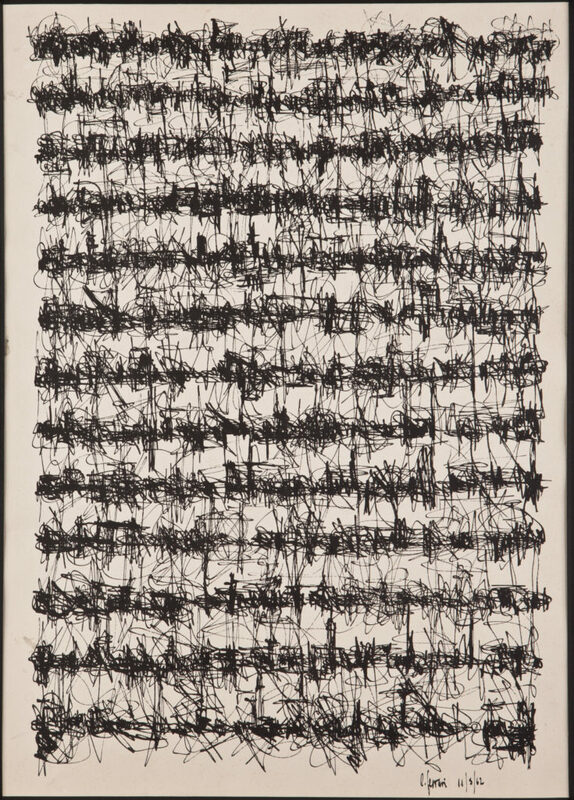 He returned to producing sculptures with straight wires, making a series of Escrituras, in which he reflected on his artistic production and “planos imposibles” from architectonic symbols in Letraset. With these Escrituras and “planos,” reproduced by means of a photocopy machine, he carried out experiments of postal art entitled Flasharte and Heliografías. His sound such as Berimbau (1979) and Percanta (1980) belong to this period. Beginning in 1982, Ferrari traveled periodically to Argentina. In 1983, he made the monumental Uma cathedral aó vento dos dereitos humanos in São Paulo, and began the series of collages Relectura de la Biblia, in which he combined the iconography of Catholicism with contemporary Eastern eroticism. Another series of works inspired by the Christian concept of hell began in 1987, with a cage in which doves defecated on images of the Final Judgment. One of his more important exhibitions with an anti-religious theme was Heretic Chapel (Franklin Furnace, New York, 1987). In 1991, Ferrari returned finally to Buenos Aires, where he initiated the series Errores, in which he drew curves of hand-raised mathematical equations to represent the contrast between the exactness of science and human imperfection. In 1997, he made his first works of the series Brailles, writings in Braille over images of Western art intended for touching by the public (Galería Arcimboldo, Buenos Aires). All the variants of Escrituras, from the 1960s to 1998, were exhibited in a retrospective at the Galería Filo (Buenos Aires, 1998). For the exhibition Infiernos e idolatrías (Centro Cultural de España, Buenos Aires, 2000), Ferrari “tortured” religious images by means of cages, kitchen utensils, bird excrement, and more. The exhibition provoked a great amount of both adverse and favorable reaction. In 2002, he returned to postal art with the series Electronicartes, illustrations with strong political content that he sent through electronic mail. 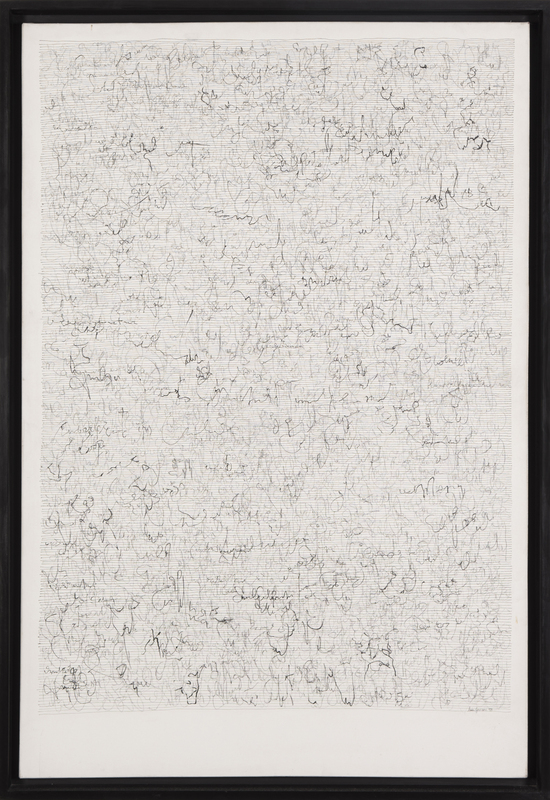 He received the Lion of Gold award at the 52nd Venice Biennial in 2007, and in 2009 his work was featured in the exhibition Tangled Alphabets: León Ferrari and Mira Schendel (Museum of Modern Art, New York, and Museo Nacional Centro de Arte Reina Sofía, Madrid).